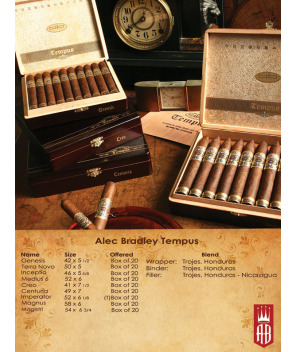 Alec Bradley Tempus is made at the Raices Cubanas factory in Honduras. Only 20% of the cigar rollers at the factory are chosen to make the Tempus brand. ALEC BRADLEY TEMPUS……….. latin meaning Time. Time is one of the most important factors when creating a great cigar; Time for the tobaccos to mature in the fields; for perfect fermentation, aging time, and time for the rich tobacco flavors to meld into one. In our industry and in our lives, time is the one component that is always in demand. Alec Bradley Tempus is created to enjoy most of what we have least….TIME Alec Bradley Tempus is made at the Raices Cubanas factory in Honduras. Only 20% of the cigar rollers at the factory are chosen to make the Tempus brand. We use select tobacco from a farm in the Trojes region of Honduras, just north of the border of Nicaragua, and some of the finest tobacco from Jalapa, Nicaragua. All the cigars are rolled in the traditional Cuban style, tubing each filler tobacco and using a triple cap finished wrapper. The five popular Cuban sizes are packed in boxes of 20 cigars and now a new unique shape in Magistri. 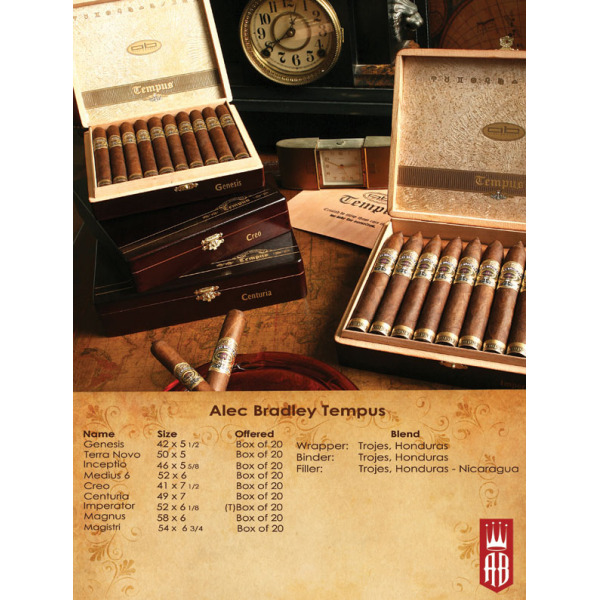 Come and enjoy one of 2008 highest rated cigars by Cigar Aficionados magazine the Alec Bradley Centuria rated 94!